Dogs with light faces often have reddish-brown stains under their eyes. In part I of this series, we looked at reasons why some dogs’ eyes run excessively, resulting in reddish-brown stained fur under the eyes and sometimes around the mouth. The causes for this can range from simple allergies from airborne particles, to a more serious problem like blocked tear ducts. It’s always a good idea to check with your Vet to ensure your dog’s runny eyes aren’t a symptom of something much more serious that’s causing pain and discomfort to your dog. Once the causes have been explored and more serious ones ruled out, NOW we can begin to correct the reddish-brown discolouration. Hydrogen Peroxide – apply a 50/50 water and Hydrogen Peroxide mix n the damp or stained fur very carefully with a makeup pad or cotton ball cotton swab. Wipe down again with clear water. Be sure you don’t get this mixture in your dog’s eyes! Cornstarch – pat some on the wet area. It will help lighten the fur and keep it dry. Make a paste from face powder and face cream – wet the stained fur and apply a bit of this mixture. It will help lift the stain right out. Vaseline or petroleum jelly – apply a small amount on the wet area; it will help keep the fur dry because the stain-causing tears will roll off. Another home remedy is to make a paste out of equal parts lemon juice and baking soda. Work this into the stained fur and leave it on for 10 minutes. 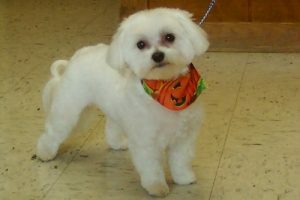 Wash out and rinse very thoroughly, following by a dog conditioner. Once the area under the eyes dries, the stained fur can be carefully cut out and the new growth kept dry and clean with any of these options above. Are commercial eye cleaners like Angel Eyes safe for your dog? Products like Angel Eyes are diet supplements – essentially permanent antibiotics for your dog. A Daily Antibiotic – good idea or not? There are two issues here: should you be giving your dog an antibiotic every day indefinitely, for what is basically a cosmetic problem? Daily use of antibiotics can cause drug-resistant bacteria, a dangerous situation. 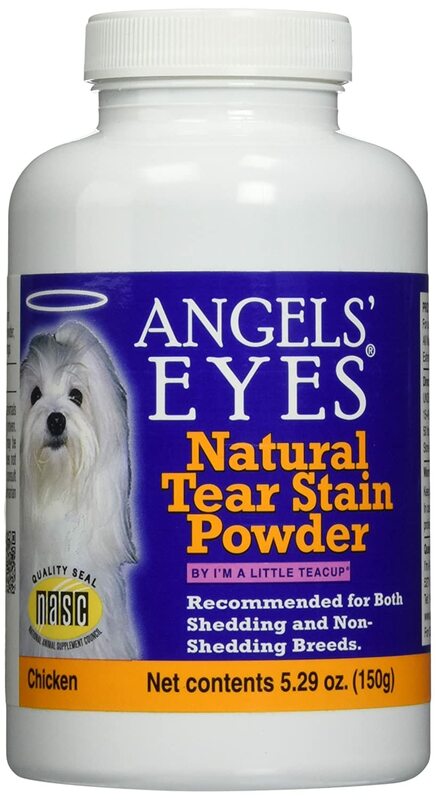 (There are other, safer ways to treat the stains under your dogs eyes, which we’ll discuss below). Second, this particular antibiotic has some powerful side effects, and can cause liver problems, teeth staining, diarrhea, and even eyesight problems. This same antibiotic — tyrosine — is available as a commercial product called Tylan. Now, does this sound like something you want to give to your dog every day? I’ve heard giving a antacid tablet to the do works ? Is this an Old Wives Tale ?